My name is Lindsey Yeakle and I have been cooking since I was a young girl. My mother is a wonderful cook and instilled in me a love for cooking when I was very young. After many years of cooking for my husband and small children I chose to go to Indiana University of Pennsylvania Academy of Culinary Arts for formal training. I graduated with high honors and went on to work in a 4-star and 4-diamond rated resort. I have a great passion for food. I am constantly researching, trying, reading, and learning about new recipes and foods. I am very interested in the latest food trends and methods in the culinary world. I have a great deal of knowledge about cooking for people with special dietary needs due to my own need to eat gluten free. I understand the severity and importance of cooking carefully and I am very meticulous about reading labels. 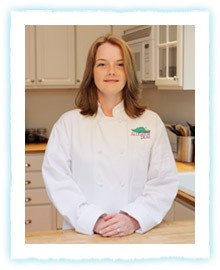 I started Alligator Pear Personal Chef Service to share my love of food and cooking. I want to prepare food customized to your tastes and needs to ensure you the best quality of life. I am fully insured, ServSafe Certified, Nutrition Certified, a member of the American Culinary Federation, and a member of the American Personal and Private Chef Institute and Association.